You wake up with a searing headache. This is not the way to start the day. As you slowly get out of bed, you soon find yourself staring into the mirror. You yawn and your teeth immediately catch your eye. They’re obviously worn down. 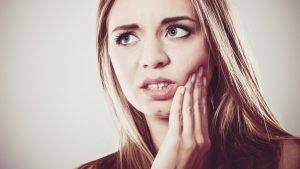 You know that you’ve been grinding your teeth at night for years, but it’s gotten especially bad in that last few weeks. What causes this? Better yet, how can you stop it? The team at Brooks Dental want you to understand your teeth grinding in Boston a little better, and let you know how you can stop it. Personality type also plays a large roll in bruxism. People who are overly competitive, aggressive, or anxious will often clench their jaw and grind their teeth without being aware they are doing it. Besides damaging the teeth, it can also lead to chronic headaches, ear aches, and facial pain. Bruxism may be difficult to control, but there are a multitude of viable methods to treat it. One of the best ways Brooks Dental can help you treat your bruxism in Boston is with physical therapy, more specifically, a series of exercises. These are meant to help address both the causes and effects of your teeth grinding. By being aware of which emotions lead to you clenching your jaw, it can become easier to consciously stop. Something as simple as placing your tongue on the back of your top teeth can make it impossible for you to grind your teeth. By placing it there throughout the day, your triggers will become more obvious. Clench your jaw as hard as you can and then slowly relax it. Try to be very aware of the sensations of it being relaxed and tense. Place your thumb on your chin and gently push upwards as you open your jaw. Then, place your forefinger on the ridge of your chin and gently push downward as you close it. Slowly open your jaw as wide as you can and then move it left to right. By strengthening and relaxing the jaw muscles, this can help prevent the tension that can lead to teeth grinding. Routine facial massages have shown to help as well. Another option is a nightguard, which is a small mouthpiece that you would wear each night to bed. It would help put your jaw into a more natural position, prevent it from clinching, and provide a physical barrier between your teeth. It can also alleviate symptoms of sleep apnea. Over time, these methods will help you stop grinding your teeth. If you are experiencing any of the symptoms we mentioned earlier, please make an appointment with us today. Teeth grinding can be catastrophic for your teeth in the long term, requiring you to get extensive restorative procedures. If you have any other questions about how you can stop your teeth grinding, please give us a call today.